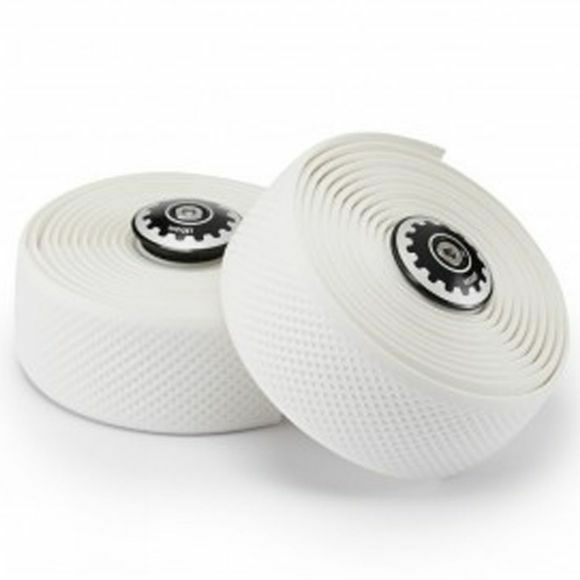 Widget’s Premium Silicone Wrap is their top of the range textured performance handlebar tape. It has a high elasticity, which allows the density to be changed for a custom cushioning fit. This hard wearing tape has superior shock absorption and a low compression memory, which means that once any pressure is removed the tape will return to its original density very rapidly. It is anti-slip in all conditions and very easy to clean. The silicone wrap can also be re-wrapped easily due to its naturally adhesive qualities. The screw-in bar end plug has a design etched into black anodized aluminium alloy and a stainless steel bolt so they will stay corrosion free and give a professional and secure finish.